Several years ago, I was at a quick haircut place waiting to have my ears lowered when I happened to pick up a copy of a magazine that was highlighting sports games (Computer Gaming World, perhaps?). This magazine was highlighting some of the best sports games of the year, and among the list was an EA distributed text-based NFL simulator called “Front Office Football“. I had had some exposure to text-based sports simulators. In fact, back in the pre-WWW years, myself and some British exchange students found a Premier League soccer simulator on a university FTP server and mailed the creator a physical check in order to unlock the full-version key. I knew very little about soccer, but the mechanics of the simulation and the ability to manage a team based on statistics and salary stuck with me enough that the magazine article became intriguing. Actually, my interest in sports simulation games pre-dates even the FTP’d soccer game. As a pre-teen, I had a fairly intense interest in baseball, and all of the statistics associated with that game. I watched baseball, collected baseball cards, listened to baseball and played baseball in the backyard with my siblings. When none of that was enough, I invented a baseball board game. I actually drew a baseball diamond on a large piece of cardboard and cut up little pieces of paper with players names on them to place around the diamond. On a notepad, I had all of the “abilities” of the hitters documented (hit fastball 1-4, hit curve ball 1-2, etc.) and pitchers (1-3 fastball, 4-5 change-up 6 curve ball etc.) with each pitch and hit chance being rolled on a 6 sided dice. If the ball was hit, I’d roll again to see where the ball was hit to, and again to see if the defensive play was made. I even named the game “Full Count Baseball”. My parents and grandparents were fairly impressed by my ingenuity, and there were even some suggestions that I should pitch the game to a major company. I’m glad that we never followed up on that suggestion, because years later I would learn about a baseball game called Strat-o-matic, which is a much more complex version of my game, and has been in existence since 1961. At any rate, I had a great time playing through seasons, championship series’, and even all-star games. 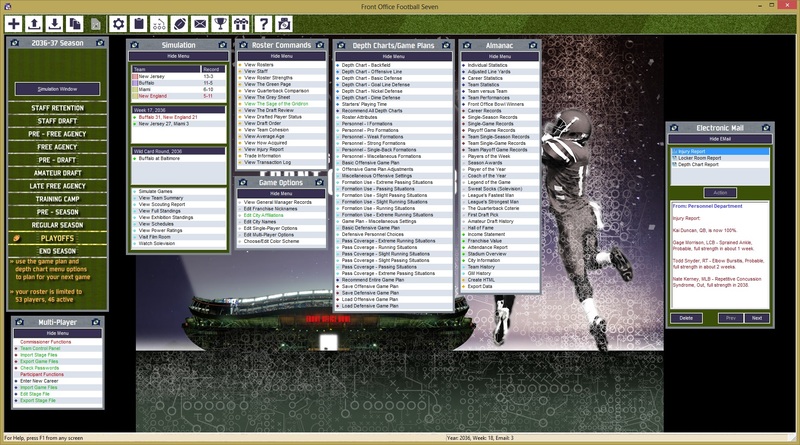 So, when I stumbled upon Front Office Football, and it’s developer Solecismic Software, it piqued my curiosity. As it turns out, Solecismic is a one-man company founded by developer Jim Gindin before indie game development was cool. He quit his day job in 1998 to pursue his dream of sports game development, and after some critical acclaim of his first version of FoF, entered into an agreement with EA who distributed the next two versions of the game. As someone who was playing both FoF and EA’s “other” major sports title “Madden football” at the time, I always contended that the Madden draft system became mysteriously incrementally better after the partnership with Solecismic. When I returned home, I looked up the game online, and ordered FoF2. Later, when Jim finished his college football simulator, I purchased that one, too. Then, I purchased FoF 2001. I believe that all of these games will run as well on my current Windows 8 computer as it did on the XP machine I originally installed them on. I think my name was at one time embedded in “The College Years” recruit database as a part of a little Easter egg Jim included in the product as a tip of the hat to his past customers. From time to time, I still check in with Solecismic. It seems that they have released a new version of Front Office Football, FoF Seven. While I haven’t yet purchased Seven, I do have an itch to revisit this franchise. The beauty of these simulators is how flexible and timeless they are. You can simulate entire seasons, or call each play for each individual game. Text-based games don’t age poorly like graphics-heavy games. I just started playing Dragon Age: Origins, and while the graphics aren’t horrible, it’s very obvious that it’s not a newly released game. What’s more, is simulators are extremely re-playable. You can’t burn through the content in six weeks, because the content goes on forever. No two teams are alike, and therefore no two seasons are alike. One thing that might just nudge me into purchasing FoF Seven would be if Solecismic manages to get it onto Steam through this greenlight campaign. Probably the only reason I’m not playing FoF any more is that over the number of computer upgrades I’ve done since 2000, I’ve wiped out my games and applications many times over. All of my Solecismic products were purchased on physical disks. I’d have to hunt for them in order to re-install the game. They’re around here somewhere. I know that because I run into them occasionally when I’m not looking for them. But if the digital download was on Steam with the rest of my games…well, that would just be ideal. No more hunting for disks to do a re-install! So, help a guy out, go over there and vote up the greenlight. It’s not like some risky kickstarter, as the game is already complete and in production. One thing I didn’t realize about these games is that people use them to play multiplayer leagues. I suppose it makes perfect sense, with the rise of fantasy sports over the last decade. I’m sure the appeal of playing with (against) friends is as strong in a simulator as it is in an MMO. That’s probably not something I’ll be doing any time soon, but the release of seven does have me thinking about poking around for my old FoF media, and maybe even giving the new one a try! They’re a nice little diversion, and they don’t require the twitchy! Damn us (big) kids and our twitch gameplay! Football (soccer) Manager is absolutely huge in Europe, and that’s basically 95% text simulator, with only the matches being played out with graphics. I’m a big fan myself, and find that these games scratch a very particular itch.